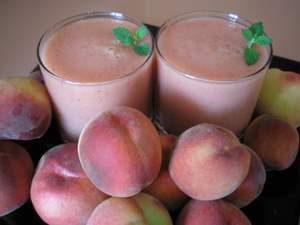 This peach smoothie recipe combines the Summer freshness of peaches with the sweet and juicy lift of watermelon. My 3 year old calls this peach and watermelon smoothie ‘The Delightful’. Sure to enliven your senses, it smells full of Summer and looks just a bit pinker than peach. It’s sweet and creamy but still has the slight tanginess of the peaches. If it made a noise it’d be singing. We’re fortunate that our generous neighbours have a peach tree that fruits abundantly. The kids get excited about picking peaches fresh from the tree and eat half of them straight away, juice and sticky fingers everywhere. Once we’ve collected a bagful of fresh peaches, we come home and whip up this peach and watermelon smoothie in less than 5 minutes. Halve the peaches and add them to the blender, skins on. Add watermelon and water to the blender. Garnish with mint or lemonbalm. Using ice instead of water turns this smoothie into a frosty delight that is superb to drink on hot Summer days while your feet are in the paddle pool. If there are any leftovers you can make icy poles or ice cubes to give the kids a healthier dessert than ice cream. You really don’t need to take the peach skins off. If you have a good blender, they add to the creaminess. Don’t have neighbours with a peach tree? 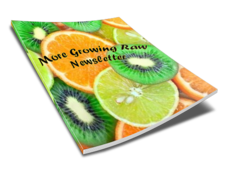 Start growing your own dwarf fruit tree. Dwarf fruit trees will grow in large containers and fruit earlier than regular fruit trees.